This tour starts in Jerusalem at 4:00PM on Thursday, January 23, 2020. Your flight should arrive no later than 1:00PM on January 23, 2020. Welcome to Jerusalem and to Israel, the Land of Living History! On arrival at the Tel Aviv International Airport, you will be met by our chauffeur for your private transfer to the King David Hotel in the heart of Jerusalem. This afternoon, we'll take a short drive to the Mount of Olives to admire the panoramic view of the Old City and to get introduced to its landmarks and its history. Jerusalem is one of the oldest cities in the world, and considered holy by Jews, Christians and Muslims. Jerusalem, the City of David was settled in the 4th millennium BC, and since then it has been destroyed at least twice, besieged 23 times, attacked 52 times, and captured and recaptured 44 times. In the evening, we'll share in the anticipation of our upcoming adventures over a welcome dinner at one of the city's upscale restaurants. Today, we'll get immersed in the history preserved within Jerusalem's Old City, as we spend the day learning about its societies and the intersecting fates of its religions: Judaism, Christianity and Islam. We'll first stop at Davidson's Archaeological Park to see the steps used by Jewish pilgrims 2000 years ago. We'll enter the Old City through the Zion Gate and walk along the Cardo, the colonnaded north-south Byzantine street leading to the Western Wall, the sacred last remnant of the Second Temple. Afterwards, we'll see the Temple Mount and the Dome of the Rock. Then we'll enter the Christian Quarter and walk along the Via Dolorosa until we reach the Church of the Holy Sepulcher, believed to be Jesus's crucification site and containing his empty tomb. After some free time for lunch and individual exploration of the Christian Quarter, we'll continue our tour with a visit to the Dormition Abbey, where we'll see the Room of the Last Supper and the Tomb of King David. In the evening, we'll walk to the Western Wall to see the Jerusalemites welcome the Sabbath, then we'll join a local family at their home to enjoy the traditional Friday dinner together. After a late breakfast today, we'll meet our guide for a tour of the Jewish side of Jerusalem. Our first stop will be the New Israel Museum to see the scale model of the ancient Jerusalem, and afterwards we'll walk to the Shrine of the Book, home of the Dead Sea Scrolls and other exhibits. After lunch at a modern Jewish cuisine restaurant, we'll have free time to further appreciate Jerusalem's famous sites at our leisure or take an optional tour to Bethlehem, before meeting in the evening to enjoy the Night Spectacular Sound and Light Show at Tower of David Museum. Today, we'll continue our exploration of Jerusalem and Israeli culture. We'll first drive to Hadassah Medical Center to view the sublime Chagall Windows, then we'll visit the Yad Vashem, Israel's National Memorial and Museum of the Holocaust with its Children's Pavilion and Avenue of the Righteous. After visiting this poignant memorial, we'll drive past the post-modern Supreme Court building and the Knesset, the Israeli Parliament. We'll have some free time for lunch at the famous Mahane Yehuda with its exotic bazaars and open-air markets for great people watching. In the afternoon, we'll meet with an Israeli screenwriter for a fascinating presentation on Israel's society through its cinema, and end the day with dinner at an upscale Jerusalem restaurant. This morning, we'll set out from the city and drive south towards the Dead Sea, the lowest point on Earth. 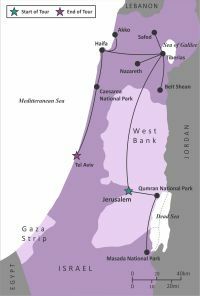 We'll descend through the Judean Desert, passing the Qumran National Park, where the Dead Sea Scrolls were found in Qumran Caves, before stopping at Masada. Here, we'll take the cable car to the mountaintop palace of King Herod and also the last stronghold of the Zealots in their fight against the Romans. On reaching the Dead Sea, we'll have the opportunity to swim in its unsinkable waters, before enjoying an afternoon at a Dead Sea Spa Resort, including a massage and a spa inspired dinner. We'll return to Jerusalem in the evening. After breakfast, we'll check out of hotel and drive north via Jordan Valleys, including the Armageddon. Our first stop will be Qasr el-Yehud, a site on the Jordan River where, according to tradition, Jesus was baptized by John the Baptist. We'll continue to Beit She'an, one of the most important cities in the region since the antiquity. Here, we'll tour the extensive remains of a lavish Roman site, complete with bathhouses, pagan temples and public theaters, then have some free time for individual exploration and lunch, before we continue to Nazareth. We'll tour the Nazareth Village which recreates the times when Jesus was growing up here, we'll take a guided walk through Nazareth Old Town and conclude at the Church of the Annunciation, where according to Christian tradition, Mary was told by the angel Gabriel that she will bear a son. In the afternoon, we'll continue to Tiberias, on the shores of the Sea of Galilee, where we'll check into our hotel and enjoy dinner in its beautiful surroundings. We'll start the day with a short drive to Capernaum, the site of a fantastic 5th century synagogue, and also the base for Jesus's Galilean ministry on the Sea of Galilee. After touring the historical and religious sites here, we'll continue to the Mount of Beatitudes, the traditional site of Jesus's Sermon on the Mount. Then, we'll ascend the Golan Heights for a visit to the ethnic Druze community, where we'll join a local family for a culinary workshop focusing on sourcing and preparation of local dishes. Afterwards, we'll travel the short distance to Safed, a magical town on a hill, known as the center of Jewish mysticism, the Kabbalah. After a guided introduction to the town, we'll have time for individual exploration of its winding cobblestone alleys, art galleries and to admire the incomparable views. In the morning, we'll travel to the timeless, rampart-ringed Crusader city of Akko, one of the oldest and most entrancing port cities in the world. Here, we'll descend into the Crusader knights' halls, navigate a secret tunnel towards the sea and walk through the subterranean Crusader city and bazaars that recall the mystical Middle Ages. After some free time for lunch, we'll head to Mount Carmel to tour an organic winery and learn about the region's wines, as we are introduced to the wine making process at this Israeli boutique vineyard. The wine tour will conclude with a tasting of organic Chardonnay and Syrah wines produced at the winery. Today, we'll check out of our hotel and travel south. We'll start with a tour of the city of Haifa, where the slopes of Mount Carmel meet the waters of the Mediterranean Sea. Here, we'll explore the Shrine of the Bab, whose brilliantly gilded dome dominates the city's skyline and the unbelievable Baha'i hanging gardens which surround it. We'll have free some time for individual exploration and lunch in Haifa's German Colony, founded by Knights Templers, as one of their 7 colonies in the Holy Land. Then, we'll continue to the great ancient city of Caesarea, built by King Herod, who named it in honor of the Roman emperor Caesar Augustus. Here, we'll tour one of Israel's main archaeological sites, including a reconstructed Roman theater, Roman-built harbor, the seafront Promontory Palace, the hippodrome and aqueducts, featuring frescoes, mosaic floors and stone seating. In the afternoon, we'll travel to Tel Aviv and check into our beachside hotel. We'll spend the full day today, exploring the modern city of Tel Aviv. We'll tour the White City of the splendid Bauhaus architecture and the magical Neve Tzedek with its pastel color homes. We'll see the Israeli Philharmonic, the Habimah Theatre, the impressive Opera House, and the Yitzak Rabin Square, dedicated to the late Prime Minister. We'll have time for lunch in the colorful Carmel Market and we'll be able to browse through arts and crafts fair on Nachalat Binyamin Street. After lunch, we'll continue to Old Jaffa, and after returning to the hotel, there will be time to relax or take a stroll along the beach promenade, and in the evening, we'll meet for our farewell dinner at a contemporary Israeli restaurant, where we'll toast our Israeli adventures with some excellent Israeli wines. This is our last day in Israel, and depending on your flight time, you may have some time during the day to further explore the city of Tel Aviv and its beautiful beaches. Your private airport transfer will be arranged in accordance with your departure time. This tour ends on Sunday, February 2, 2020 in Tel Aviv. We will arrange your private airport transfer according to your flight departure time.